Half of humankind, the female gender, is under-represented in science, and even more poorly represented in the material sciences. One of the ambitions of the L’ORÉAL-UNESCO Awards is to help bridge this gap and bring international recognition to these exceptional women scientists. This year's awards coincide with the World Year of Physics and are devoted to Material Sciences. Physics allows us to better understand the world of today and build the world of tomorrow. The Laureates work in the most promising areas of physics: nanoscience or quantum physics. Their research concerns the technologies of semiconductors, measuring atmospheric pollution, the extraction of heavy petroleum trapped underground. It is also the stuff of dreams, such as building a module for the International Space Station on Mars or developing quantum computers that could revolutionize the way we work today. The Awards were presented to the L’ORÉAL-UNESCO Laureates on March 3rd by Koïchiro Matsuura, UNESCO Director-General, and Lindsay Owen-Jones, Chairman and CEO of L’Oreal. Nicole Ameline, French Minister for Parity and Equality in the Workplace, participated in the ceremony in her capacity as President of the Honorary Committee. Pierre-Gilles de Gennes, Nobel Laureate in Physics, presided over the evening's events in the presence of the members of the international jury and Christian de Duve, Founding President of the Awards and Nobel Laureate in Medicine. As a natural extension of the L’OREAL-UNESCO Awards, given to exceptional women scientists, a L’ORÉAL-UNESCO Fellowship programme was founded to encourage young women researchers in the Life Sciences. The 2005 list of 15 Fellows includes a strong showing from emerging countries such as Burkina Faso, the DPR of Korea, Jordan, and Cuba. This programme's international impact is strengthened by initiatives organized in more than 15 countries – national fellowships seminars conferences and mentoring programs to familiarize young girls with science as a career. These actions are intended to encourage women from all continents to pursue careers in science. 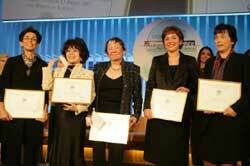 Created in 1998, the L’ORÉAL-UNESCO FOR WOMEN IN SCIENCE Award is the fruit of an exemplary collaboration, illustrating how the private sector and an intergovernmental institution can pursue joint projects to support women of science, encourage the advancement of knowledge and enhance development on a global scale. With the renewal of the L'ORÉAL-UNESCO framework agreement in 2004 for an additional five years, these two partners have committed themselves to increasing the programme's international impact. L’ORÉAL is the world's number one cosmetics company, present in 130 countries worldwide. Nearly 3,000 people work in L'Oreal's 14 research centers in Europe, Asia and America; each year, their findings are responsible for the registration of more than 500 patent applications. 55% of the research workforce is made up of women, a percentage unmatched anywhere else in the industry. Since its creation in 1945, UNESCO has been dedicated to eliminating all forms of discrimination and promoting equality between men and women. While designing scientific education programs intended especially for young women, UNESCO has created several academic chairs to connect women of science around the world. The Organization also develops new indicators intended to measure women's access to scientific education and to help develop appropriate policies in its 190 Member States. ·Zohra BEN LAKHDAR (Tunisia) "For her experiments and models in infrared light spectroscopy and its applications to pollution detection and medicine." ·Fumiko YONEZAWA (Japan) "For her pioneering theory and computer simulations of amorphous semiconductors and liquid-metals." ·Dominique LANGEVIN (France) "For her fundamental investigations of detergents, emulsions and foams." ·Belita KOILLER (Brazil) "For her innovative theoretical research on electrons in disordered materials such as glass." ·Myriam P. SARACHIK (United States) "For important experiments on electrical conduction and the transition between metals and insulators."